Learn how to make easy Thanksgiving centerpieces. These can be the focal point of your dinner for that special day and they are edible . Unlike other parties or dinners you might entertain for, having a special day in itself sets the theme. The advantage of having this theme and coordinating around it can turn a small get together into a festive party. Having a theme helps you to organize all aspects of your social event. Around this theme you will have the choices of what type of foods to serve and what type decorations you want including how to make an easy Thanksgiving centerpieces you want to decorate your table with. Most of the time the basic recipes used for Thanksgiving include many of the traditional recipes passed down through our families from year to year. Many of us might add a new dish or two from year to year but our Thanksgiving centerpieces are usually never the same. Some years we might even decide to eliminate them altogether. As you are learning how to make easy Thanksgiving centerpieces you will find the most common ones are made up of flowers using the typical colors of fall and this holiday. 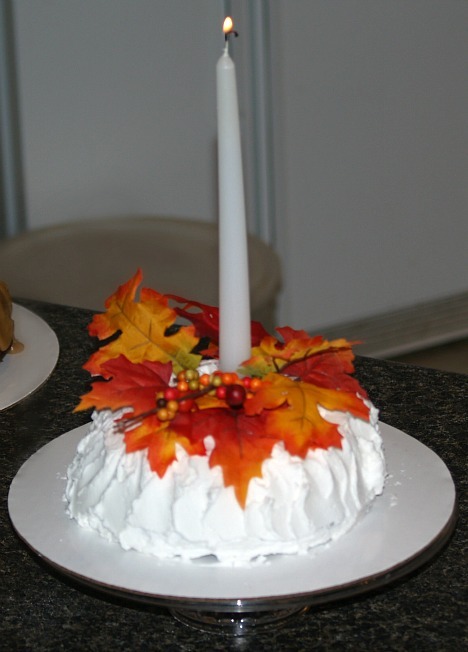 I have used these for many of my Thanksgiving dinners over the years and usually adding candles in the arrangements for the special occasion. Fresh fruit and vegetable arrangements are another good choice for the table adding the essence of fall. As I have said, I used floral arrangements on my table for many years. Over the years they have become more and more expensive. After a few days they will then wilt and die so you have nothing left for your money. I do love the fresh flowers on my dinner table but this year I want to focus on making Thanksgiving centerpieces from food. Many of us are struggling with the high cost of food today so why not incorporated our Thanksgiving centerpieces in our dinner. Almost always we want to have desserts in our menu for this special day so I am making some basic dessert recipes which can be used for decorating with food on our holiday tables. My first simple selection is a chewy brownie recipe. You can’t go wrong with chocolate and the black walnuts add a touch of fall. 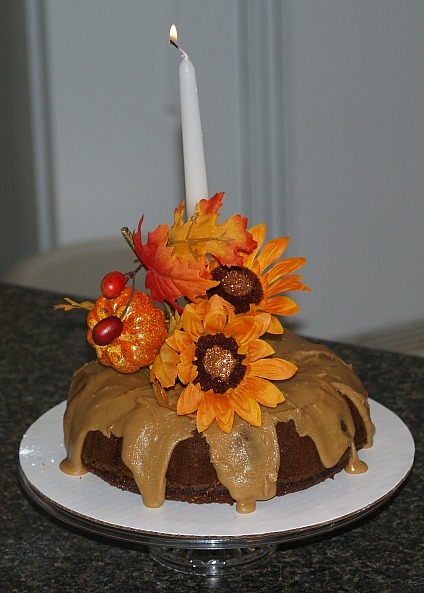 This Thanksgiving centerpiece also is made extra special with bourbon and topping it with chocolate glaze. The eight inch round brownie cake is cut into wedges and decorated with candles; each piece can be individually decorated for the holiday if you like. It is very easy and elegant setting on top of a pretty cake plate. An apple carrot cake recipe baked in a Bundt cake pan also makes a delicious and pretty Thanksgiving centerpiece for the holiday table. Again it is easy to make, serves as a great dessert and the great blended flavors will sure to be a hit with your guests. After cooling, add a little of your favorite frosting and a pretty candle in the center of the cake gives a light to the celebration. I am making another Thanksgiving centerpiece from an old fashioned gingerbread recipe. It is baked in a bowl; this one is for you who have told me you are lacking in baking pans. When the cake has cooled completely it is sliced and filled between layers. Top with some pretty fall flowers and you have another elegant table topper. Grease well and flour stainless steel or glass baking bowl. NOTE: I used a 4 quart bowl and I placed a small piece of wax paper on the bottom so It wouldn’t stick; grease and flour over wax paper also. In large bowl beat 1/3 cup butter and ½ cup sugar until fluffy; add molasses and eggs and blend well. In medium bowl combine flour, soda, ginger, cinnamon, nutmeg, allspice, ½ teaspoon salt and cloves. Add dry ingredients to molasses mixture alternating with buttermilk; beat well after each addition. Pour batter in prepared bowl; bake about 90 minutes on lower oven rack. NOTE: Checking with pick for doneness can be deceiving because the top may seem done but the bottom is not done yet; this can be helped by inserting a metal cake pick in bottom or a metal flower nail to help distribute heat. Remove immediately from bowl to cooling rack; cool completely. In medium saucepan combine ½ cup sugar, cornstarch and 1/8 teaspoon salt; mix well. Gradually stir in boiling water; bring to a boil and cook over medium until thickened stirring constantly. Remove from heat; add 2 tablespoons butter, lemon peel, lemon juice and mix well. When cake is cooled slice in 2 layers and fill with lemon sauce. Top with favorite frosting or some of the lemon sauce; decorate for Thanksgiving. The delicious fall ingredients in this cake recipe make it a great favorite of the Thanksgiving centerpieces as well as a great dessert to finish the holiday meal. Combine flour, sugar, baking soda, cinnamon and salt. Mix together the apples, carrots, dates, coconut, pecans, eggs, oil and vanilla. Add wet ingredients to the dry ingredients; stir until moistened. Spoon into well greased and floured Bundt cake pan. Bake for 40 to 45 minutes or until pick comes out clean. Cool 5 minutes; remove cake from pan and cool completely. Place cake on plate and drizzle with favorite frosting. (Or dust with powdered sugar. Grease and line 8 inch round cake pan with wax paper; grease again and lightly flour. Soak nuts in 2 teaspoons bourbon; cover and set aside. Melt butter and chocolate over low heat; cool. Combine flour, baking powder, salt and sugar together. Add cooled chocolate mixture and beaten eggs to flour mixture; mix only until blended. Stir in bourbon soaked black walnuts; spoon mixture into prepared pan. Bake for 35 minutes; do not over bake. NOTE: This cake is very rich and “fudgy”. Cool for 5 minutes; loosen from side of pan with knife. Turn out onto rack to cool; remove wax paper. Turn brownie cake over onto cake plate. Brush cooled cake with 2 to 3 tablespoons bourbon and let soak in. To Make Glaze: Melt 3 squares (1 ounce each) semi sweet chocolate and 3 tablespoons butter over low heat blending well. Drizzle chocolate mixture evenly over the top of brownie. When chocolate begins to firm cut into 8 wedges. Decorate for the holiday. 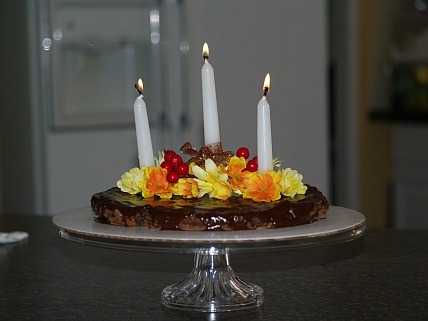 NOTE: If you are using candles to decorate with, put them in the cake as soon as you cover with melted chocolate. Also mark through the chocolate where you want to cut the pieces. Refrigerate for several hours for the chocolate to set up and harden.